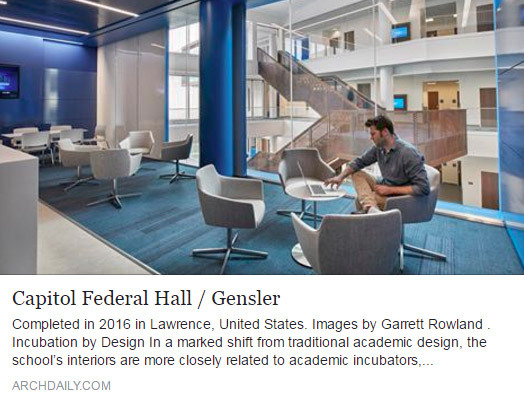 Several publications have recently written articles discussing the new Capitol Federal Hall School of Business at The University of Kansas. Last month, the University of Kansas opened the doors of its new, “future ready” business school, Capitol Federal Hall. The new facility provides state-of-the-art learning environments for graduate and professional students – creating an innovative space different than any other building on campus. By rethinking the role of the university in a student’s professional development and encouraging interdepartmental networking, students are introduced to countless opportunities on a daily basis. GastingerWalker& worked collaboratively with Gensler, the Design Architect on the project, from the very beginning through building completion. “The design concepts were always first and foremost in our overall construction documentation,” said Kevin Harden, AIA, Managing Partner at GastingerWalker&. “The budget was tight and the schedule a challenge. We creatively figured out ways to get more with less money from the design of the building skin to the right sizing of the corridors and classrooms. There was not a square foot in excess in the overall design." The building features 166,500 square feet of cutting-edge technology, 21 classrooms, a 350-seat auditorium, and over 25 different collaborative spaces. Flexible rooms, moveable furniture and a four-story central atrium allow for teachers and students to interact in a new manner, encouraging connection and potential for ideas. The key focus of this non-traditional layout is on innovation and collaborative spaces. Openness, natural light, changing views, and accessibility were integral to the design of this building, as well as opportunities for serendipitous encounters. “We are already seeing the success in attracting students to the business school from conversations with individuals who now plan on taking business classes as well as others who want to return for their Masters degree to be in this building," said Dan Nenonen, AIA, Partner at GastingerWalker&. This significant, student-oriented design creates a unique culture and inspires an entrepreneurial spirit. Capitol Federal Hall accommodates a number of emerging initiatives that will carry the reputation of the institution into the coming century.